It’s Friday and that means that it’s time for another dose of the Freebie Friday! Today’s freebie is associated with our game Spirit Lake and it’s an authentic and copyright-free Native American photo. Our freebie is a historical photo of the census being taken at the Standing Rock Agency. 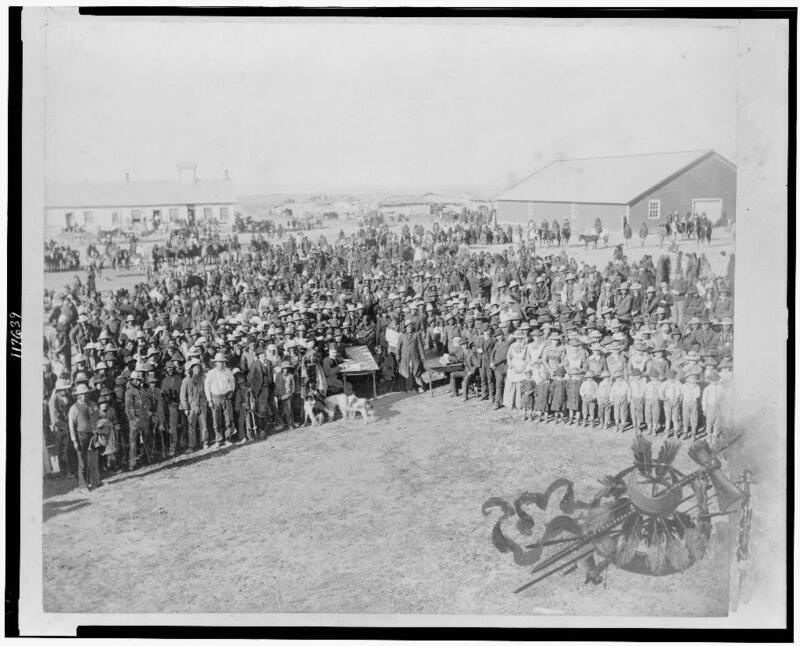 In the photo you can see Dakota and Euro-Americans gathered around Euro-American men at tables for census at Standing Rock Agency. View the photo below. We at 7 Generation Games think it’s important to have authentic Native American photos, so much so that we have a blog about the work put in to acquire these photos and another blog featuring more really great Sioux historical photos. Photos like the one above are a great supplemental resource and way to bring the game Spirit Lake to life. This photo and others can be found on our Spirit Lake Photos website page. There you can find great photos of Native American life provided by the Library of Congress website. Feel free to head over to our Spirit Lake photos page to see more photos of Native American life that you can utilize at home or in the classroom. Also be sure to check out the Library of Congress for other great photos as well. Finally, be sure to browse the many other resources we provide on our Teacher Resources page. Have a great Friday and weekend. Make sure to come back next week for another Freebie Friday! Looking for great educational games? We have you covered. Check out our games here!